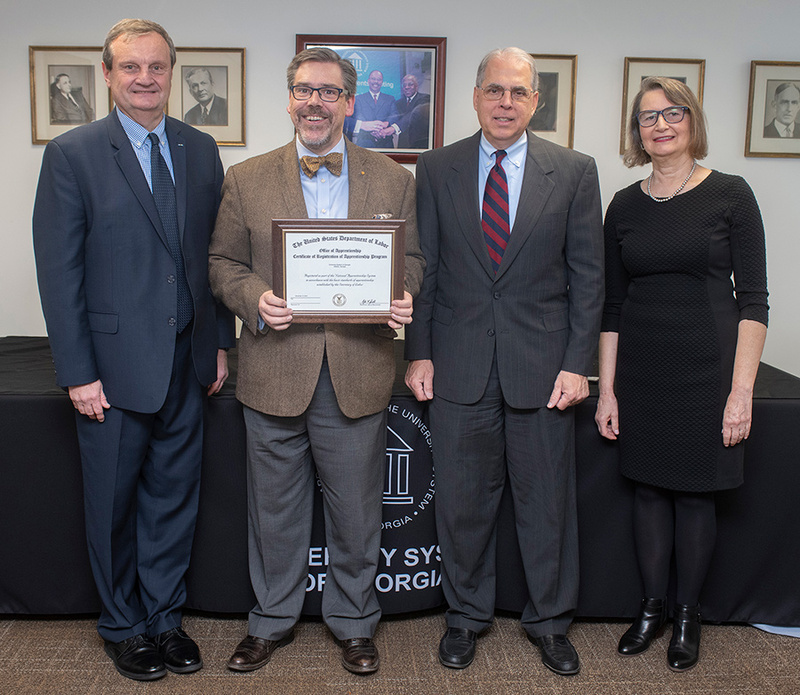 The University System of Georgia (USG) and the U.S. Department of Labor entered a new collaboration that aims to increase the number of skilled workers who pursue a career in cybersecurity. The two organizations jointly signed the Registered Apprenticeship Standards in Cybersecurity. The agreement marks the first time a public four-year university system and the Labor Department have partnered to implement standards that will guide USG institutions and the Georgia FinTech Academy as they increase the availability of apprenticeships that specialize in the cybersecurity field. The agreement comes as the USG has continued to do extensive analysis on the fast-growing financial technology (fintech) business environment in Georgia. That includes a special emphasis on cybersecurity, which the apprenticeship program aims to address. The USG Apprenticeship Initiative is designed to offer flexibility for both employers and learners that need “anywhere/anytime” options. Three delivery models and a stackable degree apprenticeship option are available, including the possibility of earning a USG nexus degree. The nexus degree is a new, highly specialized college credential aligned to high-demand careers and requires a heavy emphasis on experiential learning. Among apprenticeship options expected to be available in the USG program will be those fully on-site at local employers’ workplaces. Remote apprenticeships with residency, which use a combination of remote and onsite work time, will also be available. So will virtual apprenticeships. The program overall will be competency focused and delivered through a combination of course-based and experiential learning, as approved by each individual employer. Because of the strong virtual platform offered through the Georgia FinTech Academy, learners will be able to access the program regardless of where they live in the state or in which college or university they are enrolled. Employers of any size and in any location may register for the USG Apprenticeship Initiative. Employers provide the apprenticeship placement and career-oriented activities including pay, supervision, mentoring and evaluation of the apprentice’s progress towards mastery of the defined standards. A centralized system for the program will be managed by the Georgia FinTech Academy, a collaboration between Georgia’s fintech industry and the 26 public institutions of the University System of Georgia. For more information, visit https://www.georgiafintechacademy.org/.